As we enter the month of November, we thank God for his faithfulness to us Israel past month. Although the spiritual battle against the people of Israel and the land of Israel continues to rage, God somehow still manages to give us a peace that surpasses understanding and a perseverance to keep our eyes focused on being a blessing in spite of all attacks of the enemy. The political horizon is shifting both within Israel and around Israel, but we are confident that God will provide a way to continue thriving in the face of adversity. A number of farmers in the Arava in southern Israel are paying the price for Jordan’s recent decision to not renew certain agricultural agreements that had been in place since the early 90’s. Please first pray that Jordan will change its mind and renew the leases on shared agricultural land. Please also pray that even if Jordan refuses to renew the leases, Israeli agriculture will continue to thrive and that these farmers will be given opportunities to excel in spite of the decreased cooperation with Jordan. Until now, the farmers had been allowed to lease land in Jordan and so find work in Jordan. Now due to the change of policy in Jordan, these farmers will have to keep their work within the borders of Israel. Although Israeli farmers can and will succeed without the need for cooperation with Jordan, this shift in Jordanian policy does reflect a time of increased tension between Israel and Jordan. Israel is very dry, despite some bouts of rain that we recently received. The Sea of Galilee is drying up quickly, and it’s quite sad to see how far the shoreline has receded over the past year. While Israel has made use of wonderful desalination techniques, and reuses over 90% of its wastewater (the highest of any other nation in the world! ), we still need to replenish our freshwater supply. Please pray for an abundant rainy season! 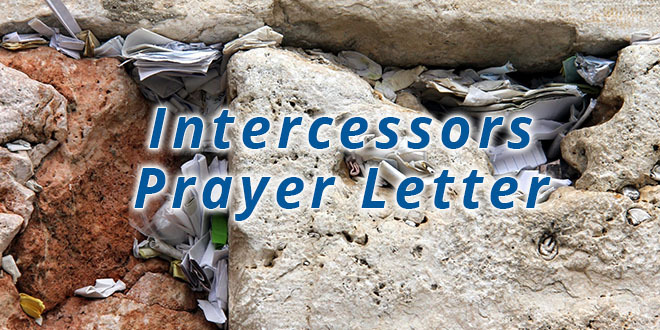 Please also pray that Israelis will continue to conserve water in their homes and businesses, and that people will understand the gravity of the situation. Despite the drought, towards the end of this past month, we saw some pretty powerful storms in Israel, especially in the north. One storm led to the drowning of a child in southern Israel and hail damage in northern Israel. Please join us in praying that as we receive the blessing of our yearly rains in the coming months God will protect our family members, our homes, and other properties from damage. Efforts to achieve some semblance of peace along Israel’s border with Gaza have not gotten far. Egypt has been attempting without success to assist in a reconciliation effort between the factions of the PA (between Hamas, the faction controlling Gaza, and between Fatah, the faction controlling parts of Judea and Samaria). It is clear that Hamas must be demilitarized, but the question is how: will Fatah take authority in Gaza and demilitarize Fatah themselves or will Israel be forced into war with Gaza? Please pray for peace in as much as there can be peace in the region at this point in time. Please also continue to pray for protection as the rockets and incendiary balloons continue to be sent into Israel targeting civilian populations. Moran will be traveling the first two weeks of November. He will be meeting with the ministry’s board members on November 8th, and then will be speaking in Arizona and Florida the following two weekends. This is after an already busy season with tour groups in Israel, so we ask for prayer for him for health, wisdom, strength, good sleep, and patience as he travels. Please pray for Melissa and the children during his absence, for health (especially as the weather is cooling in Israel -no illness! ), for good sleep, protection, and peace for them all. Please also pray for Melissa as she will be juggling work & studies for her MA, while “holding down the fort” during Moran’s traveling. The enemy often attacks her sleep during these times, which makes everything else all the more difficult to handle. Please continue to pray for wisdom for our board members as they make important decisions in every area of the ministry. Please pray for their annual board meeting this month (November 8th). Lastly, please pray for protection over them and their families, that the Lord would shield them from illness and spiritual warfare. Please keep our staff covered in prayer during Moran’s traveling. Please pray for the various challenges our staff are facing, including Joanna, our Business manager who will be undergoing surgery this month to remove some tumors in her stomach. Please pray for wisdom for the surgeons and for a miraculous healing. We are still looking for someone to hire in our media and tour department. Please pray for the Lord’s much-needed provision in this area. Please keep each and every one of the youth in your prayers that they will find NerYah to be a place of encouraging fellowship and guidance through the challenges they face as youth in Israeli society. Please also pray for more male volunteers to work with the youth. We are still in need of more volunteers to work with our soldiers’ group. Please continue to pray for the soldiers both that they will excel and that they will be strengthened by God to continue strong in the faith in spite of the many challenges they face. Pray that God will use them powerfully also to encourage those around them as they experience a level of discipline that they have never before encountered. Hope for Israel is working with a number of college students who were once with us in NerYah and a part of our Soldier’s Group. Please pray that all of the students with whom we’re working will continue to develop successful learning strategies and that we will be successful in helping as the need arises throughout the school year. Please continue to pray that every copy of this discipleship resource will have a personal impact on those who read it and draw many into an increasingly deeper relationship with God! Please pray for a wider distribution of the book, that it will reach many people and that they will be strengthened and challenged. Please also continue to pray that the current project to publish the book in Spanish will be blessed and bring forth a fruitful harvest among our Spanish-speaking brethren. We began this special project in January in honor of Israel’s 70th year of independence (click here to check it out). This is a video project where we produce short videos highlighting a different aspect of Israeli innovation that is making a difference in the world. This project is a means of Israel advocacy, which is an important part of our call as the Body of Messiah throughout the world. But of course, this is also a threat to the enemy and we have experienced some warfare in this area. Please pray for us as we continue to produce powerful & effective videos, and for all involved in this project: Lior, Moran, Nate, & Melissa. Please pray for His protection over us all and for the truth about Israel to reach to the ends of the earth! We are in the final stages of getting our quarterly newsletter published. Please pray for all involved in this project, from writing & editing, to design, to printing, & distribution! May the Lord be glorified in this project! Please join us in praying for each and every one of our tours to be a blessing both to those who join and a blessing to the work of Hope for Israel! We host three tours per year: Experience Israel Tour, Israel-Greece Tour, & the Pastors’ Solidarity Tour (click here to learn more). These tours generate income for the ministry, which goes to cover our overhead, thus allowing a higher percentage of donations to go to our projects. Thank you for joining us in prayer for these things! May the Lord bless you.